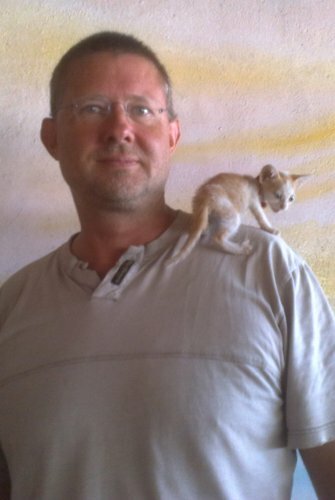 After escaping the ashram I returned to Trivandrum, and then took my first Indian train in many years. I've kinda forgotten how Indian trains work. Ok ok there's an engine at the front and it pulls the carriages. Got that, I mean the ticket buying process, and the classes. I'm going to Kochin a 4.5 hour train ride with frequent trains, so this is a good opportunity to wing it. I go to a ticket window, and the clerk tells me there's a train leaving in 5 minutes from platform 2, and sells me a 2nd class ticket. There are nine classes and 2nd class is the lowest. Its the only class where reservations are not needed, best to turn up 1 hour early to get a seat. So no seat space, not even floor space. Some lads have climbed up onto the luggage racks, and they invite the Westerner up. I survive but decide I'm too old for 2nd class. I stayed 5 days in Kochin. One of the highlights of Kochin is Jew town. The Indians are proud of how they've treated their Jews over the centuries. I've always thought India is a favourite Israeli destination because of the price, but maybe its payback to one of the few countries they can feel grateful to? In Kochin I bump into many people from the Ashram including Claire a girl who's adopted an abandoned kitten she's named Gizmo. I've heard a lot of good about Gokarna a beach area in Karnataka. It's a 12 hour train ride so I go into a travel agent. They book me a ticket and reserved bunk in sleeper class, one step above 2nd class for a Rs50 service fee. Claire and her friends are sharing the train compartment with me. I think she's mad if kind hearted, but a kitten is good value on a long train ride, and we all take turns hunting milk at stations. Gizmo is convinced Claire is his new mother, and gets frantic if he can't sense her, but quickly accepts me as being a trustworthy human in the absence of Mum. 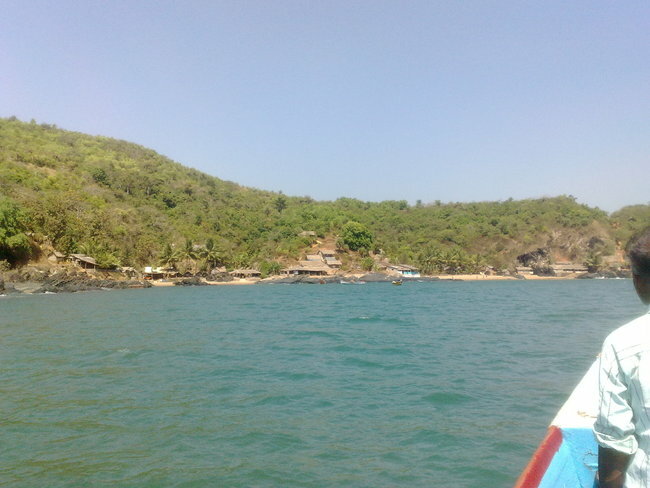 There are 5 beaches strung out from Gokarna town: Kudlie, Om, Half moon, Little paradise, and Paradise. We all share a taxi to Kudlie, and it is indeed a glorious beach, and the only one with a proper sunset. There's one swank hotel made of concrete, but everything else is made completely from natural materials, bamboo poles for the structure, and woven coconut fronds for the walls and roof. 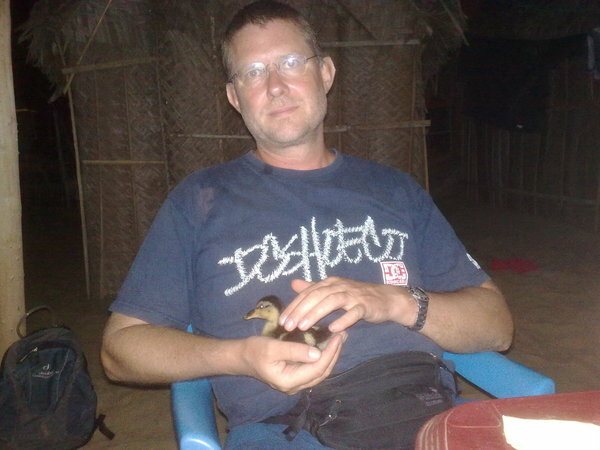 While staying at Kudlie, two Danish girls turn up with 2 ducklings they've bought in Nepal, and carried almost 3000km with them to South India. I also think they're nuts, but am happy to duckling sit. My animal magic that makes dogs, elephants, and kittens trust me also works on the ducklings, and after an initial nervousness, they settle into the palms of my hand. At one point a dog scares them and they scamper up my chest, like ducklings climb onto Momma duck when they sense danger. 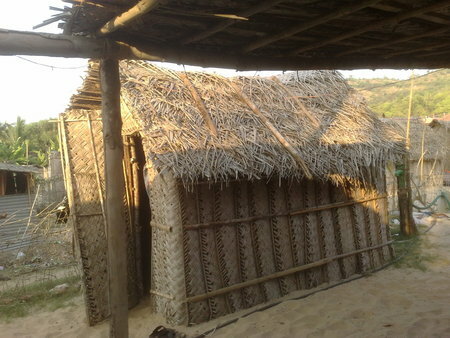 Gokarna is an important pilgrimage town but the beach infrastructure exists solely to entertain tourists. 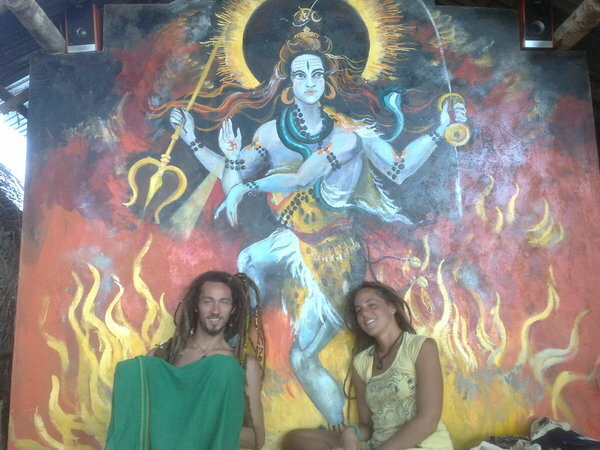 My yoga instructor at the ashram asked me for an update on Gokarna as he was thinking of doing some R&R there. Kudlie & Om beach, I'm surprised that the aviation administration hasn't ordered some of the lights toned down so planes don't mistake the beach for a runway. However there are only natural structures on both beaches, except for Namaste on Om, and the expensive hotel on Kudlie. Paradise has lots of solar, you can charge netbooks and phones there, and even surf. Especially it enables cafes to play music. Loud! Half moon has 3 cafes, all with solar, only one with stereo, and little paradise still has no solar, or running water. You may have got the hint I'm easily annoyed by noise. There's a continuous stream of drum salesman, and a lot of Westerners have bought drums. They all beat a simple drum rhythm 1234-12. It takes about 30 seconds to master, admittedly I'm unashamedly unmusical, I guess a musical person could master it in 10 seconds. Having mastered this rhythm they believe they are master drummers, drumming out the sound of nirvana. They drum for hours. 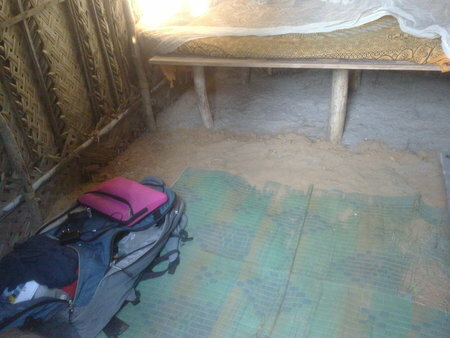 They drum in restaurants, in the communal area between the huts where we sleep, and down on the beach. They drum to the full moon, and to the half moon, and to no moon. They drum at midday, and at midnight, and 2 o'clock in the morning. No time, and no place is bad to drum because they are drum masters, rapping out the sound of ecstasy, and who could be disturbed by that??? They drum in solitude, they drum in groups which like heightens the energy man. One evening I joined a bonfire group of about 30 people down on the beach. There are 2 drummers facing each other, a grand master, and novice master. The novice master's eyes are rolling in his head as he goes into a drumming ecstatic trance. However his rolling eyes keep seeking the calm staring eyes of the grandmaster, who anchors the novice, and allows him to experience his ecstatic trance without going off the rails. Except WTF!!! Its a drum. You don't go into a trance drumming unless you've taken psychedelic drugs, and then you're going into an ecstatic trance anyway, so why not just enjoy the psychedelic drugs and put the stupid drum aside? Kudlie beach is only a 15 minute walk from Gokarna town, an almost medieval temple city, and is almost as big a draw as the beaches. A short detour takes you to the sadhu who has quite a nice cave. A sadhu has renounced all possessions, family and comforts to lead a life of meditation and contemplation. 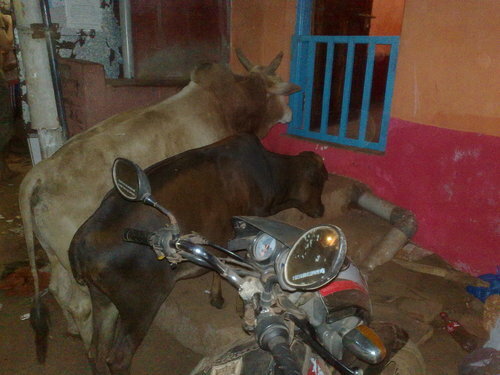 They perform pujas and live off donations, and are also assured a meal and bed (space on floor) in any ashram. All the sadhus I've encountered have been carefree and cheerful. This one is no exception, and already has 2 visitors. He looks into my eyes and pronounces I'm a guru. Wow, at last I've been discovered! I find out he tells everyone he likes they're a guru. He enthusiastically performs a puja, exclaiming “nice puja”, offers me some food and then asks for a cigarette. After a while a group of 10 Western tourists turn up led by a guide. They shuffle around the cave, photograph everything, and then leave without saying a word to the sadhu or us. One of the visitors jokingly asks why no puja for them, and he snorts as if to say no puja for those kind. Then I say they didn't come to visit the sadhu, but to look at an animal in a zoo, and he bursts out laughing. His English is better than he lets on. Next time I visit him I bring some vegetables and a pack of cigarettes, only to find he's been beaten up by a gang of Russian tourists, and has moved to Paradise beach. I try to give him the cigarettes there, and he just snorts and pushes past me. I can't blame him for avoiding all westerners. I spend 28 days on Kudlie beach. I've been bitten by an idea, and since my first encounter with the sadhu I'm hammering furiously at my computer for 12 hours a day. I get up in the morning with my netbook fully charged, and take it to the cafe where I work for 6 hours until the battery is dead. It will take 2 hours to charge back in my hut, so I can go for a swim, or hang out, and then its time to wear down the battery again. 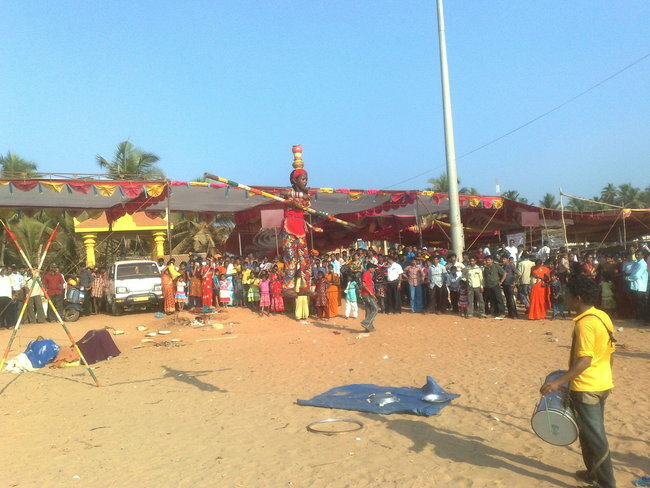 While I'm at Kudlie there's a big festival Shivagiri at Gokarna. 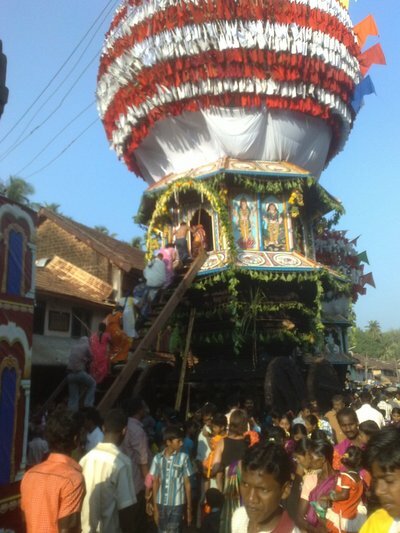 On the last day hundreds of men pull a giant wooden chariot. Then people climb on board so that everybody can throw bananas at them. Needless to say this festival is very popular with the monkeys. Down on the town beach fast food (gobi manchurian, puri masala) is on sale, and there is entertainment. The girl walks along the tight rope, while her father bangs the drum, and then the whole family collects money. Its sadly repetitive as they repeat this sequence about 10 times per hour, probably all day long. Eventually I remember I don't really like Kudli beach anyway. Om is only a bit less developed, and there are as many idiot drummers. But there's electricity! Half moon I really like, but if I stayed there I'd have to commute back to Om to recharge the battery. Paradise offers the best of both worlds. It is idyllic, cut off, water comes from wells, there's no electricity, except that provided by solar. Paradise is a completely solar environment. Every guest house has solar panels, car batteries and a UPS (uninterpretable power supply) which generates mains voltage from car batteries. Two of the guest houses have more solar than the others, and they will let you recharge a netbook for Rs40, or a mobile phone for Rs10. Rs40 abou €0.70 is an outrageous price for charging a 4400mAh battery by normal electricity standards. However these are not normal standards. Mains electricity finishes a 15 minute walk from paradise, and investing in solar infrastructure is expensive. The UPS is probably the cheapest, there are 100s of kg of car or truck batteries, but of course the most expensive item is the solar panels. And despite the harsh Indian sun, you still need quite a spread of solar panels to allow a few netbooks to be recharged, guarantee the lights will run all night, and have some juice left over the annoy me with a too loud stereo. So the guesthouses need to recoup their solar investment. Its a pet topic of mine that is well demonstrated in the microcosm of Paradise beach. Oil is too cheap. Because oil is so cheap alternative energy is borderline or not at all economically viable. However alternative energy is booming in Paradise because its economically and logistically unfeasible to run mains electricity 3km from the next village for 10 guest houses supporting 300 Westerners 4 months of the year. And when I say oil is too cheap, I mean the price of pumping, refining and shipping it. If the cost of burning oil were to include the projected cost of scrubbing the released carbon dioxide back out of the atmosphere, oil would be drastically more expensive, and alternative energy would be the cheap option. And billions would be spent on research to make alternative energy even cheaper and safer. Note in my book nuclear fission is alternative, and despite rather nasty incidents in older reactors at Chernobyl, and Fukushima; pebble bed reactors are intrinsically safe, except for the not completely trivial question of disposing of spent fuel. Right back down from the soap box. I've spent one night at half moon, 1 week at Paradise, I'm determined to spend one night at the most primitive of them all: little Paradise. I leave my large backpack at the guesthouse, pack my small backpack with a toothbrush and my charged netbook and make the rather technical walk over to half Paradise. I'm kicked out of the communal area at 21:00. The guys running the place go to sleep at this time. They will wake before dawn, not to waste a second of daylight, and to make the most of the cool morning hours. It's almost full moon, and I trek around the coast for 2 minutes. The night wildlife are active, the moon reflects off the water, the stars shine down undisturbed by artificial light. I spend 30 minutes just admiring the solitude and peace. The scene is way more spiritual for me than any church, ashram, or even an Amma hug.